Dendritic cells (DC) manipulated ex vivo can induce tumor immunity in experimental murine tumor models. To improve DC-based tumor vaccination, we studied whether DC maturation affects the T cell-activating potential in vitro and the induction of tumor immunity in vivo. Maturation of murine bone marrow-derived DC was induced by GM-CSF plus IL-4 alone or by further addition of TNF-α or a cytidine-phosphate-guanosine (CpG)-containing oligonucleotide (ODN-1826), which mimics the immunostimulatory effect of bacterial DNA. Flow cytometric analysis of costimulatory molecules and MHC class II showed that DC maturation was stimulated most by ODN-1826, whereas TNF-α had an intermediate effect. The extent of maturation correlated with the secretion of IL-12 and the induction of alloreactive T cell proliferation. In BALB/c mice, s.c. injection of colon carcinoma cells resulted in rapidly growing tumors. In this model, CpG-ODN-stimulated DC cocultured with irradiated tumor cells also induced prophylactic protection most effectively and were therapeutically effective when administered 3 days after tumor challenge. Thus, CpG-ODN-enhanced DC maturation may represent an efficient means to improve clinical tumor vaccination. Dendritic cells (DC)5 are highly specialized APCs that are unique in their potency to induce T cell-dependent Ag-specific immune responses (1). After capturing and processing Ag in the periphery, they migrate to the T cell areas of lymph nodes or spleen where they sensitize naive T cells and direct their development into Ag-specific effector cells (2, 3, 4). Contact to “danger signals” like LPS, TNF-α, IL-1, or CD40 ligand expressed by activated T cells leads to DC maturation (5, 6) and IL-12 secretion (7, 8, 9). IL-12 plays a central role in the tumor-directed immune response, stimulating NK, cytotoxic CD8+ T, and IFN-γ-producing CD4+ Th1 cells. Through its stimulatory activity on undifferentiated CD4+ precursors to develop into Th1 cells, IL-12 antagonizes the action of IL-4, which promotes Th2 development (10, 11, 12). Synthetic oligodeoxynucleotides containing unmethylated cytidine-phosphate-guanosine (CpG) dinucleotides (CpG-ODN) in specific sequence contexts mimic the immunostimulatory qualities of bacterial DNA (13). In vitro, they up-regulate the expression of costimulatory and Ag-presenting molecules and the secretion of IL-12 by monocytes and DC (7, 9, 14, 15, 16). In vivo, CpG-ODN act as an adjuvant, promoting Th1 immune responses (17, 18) that can enhance protection from a subsequent tumor challenge when coadministered with tumor Ag (19). In murine tumor models, DC act as potent inducers of tumor immunity. Tumor development was induced by injection of established tumor cell lines of various tissue origins. Following interaction with tumor cells (20, 21) or selected tumor Ags (22, 23, 24, 25), DC are effective as prophylactic tumor vaccines against subsequent tumor challenges. In a few cases, even therapeutic efficacy of DC-based tumor vaccines was reported, leading to rejection of established tumors and lung metastases. These vaccines were based on fusion (20) or coculture (21) of DC and tumor cells, on tumor peptide- (26) or tumor lysate-pulsed DC (27). In the two studies reporting complete remission of established tumors, DC were generated in the presence of GM-CSF (20) or of GM-CSF plus IL-4 (21) without additional DC-activating agents. Both research teams worked with the C57BL/6 mouse strain, which is prone to raise proinflammatory, Th1-mediated immune responses (28) and injected low to moderate aggressively growing tumor cells. However, in man, aggressive tumor growth is often met by a severely compromised immune response. First clinical trials applying DC (29, 30, 31) have demonstrated therapeutic benefit (partial or complete regressions) that was, however, limited to a small proportion of patients. As inflammatory stimuli induce maturation of DC (5, 6), characterized by increased expression of MHC and costimulatory molecules, we reasoned that they may improve the therapeutic potential of DC-based vaccines. Toward this goal, we studied potential improvements and limits of DC tumor vaccines. We tested whether tumor vaccination was effective against aggressively growing, syngeneic colon carcinoma cells in BALB/c mice, which have an impaired Th1 response (32). We analyzed how enhanced maturation of DC compared with basic stimulation by GM-CSF and IL-4 alone influences their potential to induce tumor immunity, both prophylactically and therapeutically. In addition, systemic administration of CpG-ODN as an adjuvant with or without tumor cells was investigated. The concomitant in vitro characterization of differentially stimulated DC allowed correlation of the surface expression of DC marker proteins, the IL-12 synthesis and the T cell activation potential with the anti-tumor efficacy observed in the mouse model. Female BALB/c mice, 6–8 wk old, were purchased from Harlan Winkelmann (Borchen, Germany). Animal studies were approved by the local regulatory agency (Regierung von Oberbayern, Munich, Germany). The murine, BALB/c-derived Colon-26 carcinoma line as well as the murine Renca cells (Cell Lines Service, Heidelberg, Germany) were maintained in DMEM supplemented with 10% FCS, 1% l-glutamine, and antibiotics. DC were prepared as described (33) with minor modifications. Bone marrow leukocytes from mouse tibia and femur were depleted of T and B lymphocytes and granulocytes by incubation (30 min, 4°C) with rat anti-mouse CD4, CD8, Ly6G, and CD45R mAbs (Serotec, Oxford, U.K.) followed by incubation (15 min, 4°C) with goat anti-rat IgG conjugated to magnetic beads (Dynal, Oslo, Sweden) and separation in a magnetic field. Unbound cells were cultured in DC medium consisting of RPMI 1640 medium containing 10% FCS, 1% l-glutamine, and antibiotics supplemented with rGM-CSF (200 U/ml; Roche, Mannheim, Germany) and IL-4 (PeproTech, London, U.K.). After 7 days, loosely adherent cells were harvested, and expression of MHC class II (MHC II), CD40, CD54, CD80, and CD86 was quantified by flow cytometry. In some experiments at day 7 or 9, DC were additionally stimulated with 5–80 ng/ml murine TNF-α (R&D Systems, Minneapolis, MN) or with 6 μg/ml phosphorothioate-modified oligonucleotide ODN-1826 described by Yi (34) 5′-TCC ATG ACG TTC CTG ACG TT-3′ (provided by Coley Pharmaceutical Group, Wellesley, MA). To assess the specificity of ODN-1826, stimulation of DC with 6 μg/ml phosphorothioate-modified oligonucleotide ODN-1982 5′-TCC AGG ACT TCT CTC AGG TT-3′ served as control. Cells were incubated for 30 min at 4°C with 5 μg/2 × 105 cells rat anti-mouse MHC II, CD40, CD54, CD80, and CD86 mAbs (PharMingen, San Diego, CA and Serotec, Oxford, U.K.). After washing with PBS containing 2% horse serum, FITC-conjugated mouse anti-rat IgG (Dianova, Hamburg, Germany) was added for 20 min at 4°C. After washing in PBS, samples were analyzed using an EPICS Profile II flow cytometer (Coulter, Miami, FL). The concentration of IL-12p40-subunit in culture supernatants was determined by ELISA according to the manufacturer’s protocol (R&D Systems). T cells were isolated by passing spleen from C57BL/6 mice through a 70-μm cell strainer (Falcon, Heidelberg, Germany) followed by lysis of erythrocytes (Ortho Diagnostic Systems, Neckargemünd, Germany) and magnetic bead conjugate-mediated depletion of B lymphocytes and granulocytes with rat anti-mouse CD45R and Ly6G mAbs (Serotec). T cells were 60–80% pure as determined by flow cytometry. Bone marrow-derived day 7 DC were exposed to ionizing radiation (50 Gy). Varying numbers of irradiated DC (600, 3,000, or 15,000 cells) were cocultured with 1.5 × 105 allogenic T cells in 96-well culture plates for 48 h. [3H]thymidine (1 μCi; Amersham Buchler, Braunschweig, Germany) per well was added for 24 h, cells were harvested, and [3H]thymidine incorporation was counted in a Betaplate scintillation counter (Wallac, Turku, Finland). DC (5 × 106) were cocultured with 1 × 106 irradiated tumor cells (100 Gy) for 4 days in culture medium supplemented with GM-CSF (200 U/ml) and IL-4 (20 ng/ml). For additional DC stimulation, CpG 1826 (6 μg/ml) or TNF-α (20 ng/ml) was added for the last 2 days. At day 11, loosely adherent cells were harvested, washed 3 times, and resuspended in HBSS (Life Technologies, Karlsruhe, Germany). For prophylactic immunization, 1 × 106 cells were injected s.c. into the right lower flank (200 μl). Seven days later, mice were challenged by ipsilateral injection of Colon-26 cells (5 × 105 in 200 μl HBSS). To assess tumor specificity, mice were challenged by injection of Renca cells (5 × 105 in 200 μl HBSS) 7 days after immunization with 1 × 106 DC cocultured with irradiated Colon-26 cells. For therapeutic immunization, 1 × 106 coculture cells were injected at the indicated days after tumor challenge (1 × 105 or 5 × 105 Colon-26 cells in 200 μl HBSS). For vaccination with oligonucleotide as adjuvant, 50 μg CpG-ODN 1826 was injected s.c. alone or in combination with 5 × 105 irradiated tumor cells (100 Gy) in 200 μl HBSS. Seven days later, mice were challenged ipsilaterally with 5 × 105 tumor cells. According to the guidelines for the proper use of laboratory animals, mice were killed when severely suffering (e.g., shivering and showing decreased mobility). The decision was made by an investigator blinded toward the treatment allocation. Student’s t test was applied to reveal significant differences in tumor protection by differently stimulated DC. We compared the mean tumor size of controls and all treated animals (tumor-free and tumor-positive animals). In addition, we compared the mean of controls with the mean of only tumor-positive animals (tumor-free animals in treatment group excluded). A value of p < 0.05 was accepted as the level of significance. The pronounced expression of MHC and costimulatory molecules contributes to the ability of DC to potently activate T cells. As surface expression of these proteins increases during differentiation, induction of maturation may enhance the immunostimulatory capacity of DC. Fig. 1⇓ depicts the effect of different culture conditions on the maturation of DC. Basal stimulation with GM-CSF and IL-4 alone (Fig. 1⇓, upper panel) generates DC that express moderate levels of CD80 (mean fluorescence intensity (MFI) 2.8), CD86 (MFI 10.1), and MHC II (MFI 3.9). The cells also expressed CD40 and CD54 and were identified morphologically as DC by phase contrast microscopy of May-Grünwald-stained cytospins and by raster electron microscopy (data not shown). TNF-α enhanced the surface density of CD80 (MFI 8.2), CD86 (MFI 14.3), and MHC II (MFI 5.1, Fig. 1⇓, middle panel). An even stronger increase of the surface expression of costimulatory and Ag-presenting molecules was induced by ODN-1826 (Fig. 1⇓, lower panel). On average, CD80 was increased 4-fold (MFI 9.5), CD86 2-fold (MFI 24.1), and MHC II 6-fold (MFI 23.2) compared with DC stimulated with GM-CSF and IL-4 alone. Effect of differential DC stimulation on expression of MHC II and costimulatory molecules. Murine bone marrow-derived precursor cells were cultured in the presence of 200 U/ml GM-CSF and 20 ng/ml IL-4 for 7 days alone (upper panel) or additionally stimulated with 20 ng/ml TNF-α (middle panel) or with 6 μg/ml ODN-1826 (lower panel). 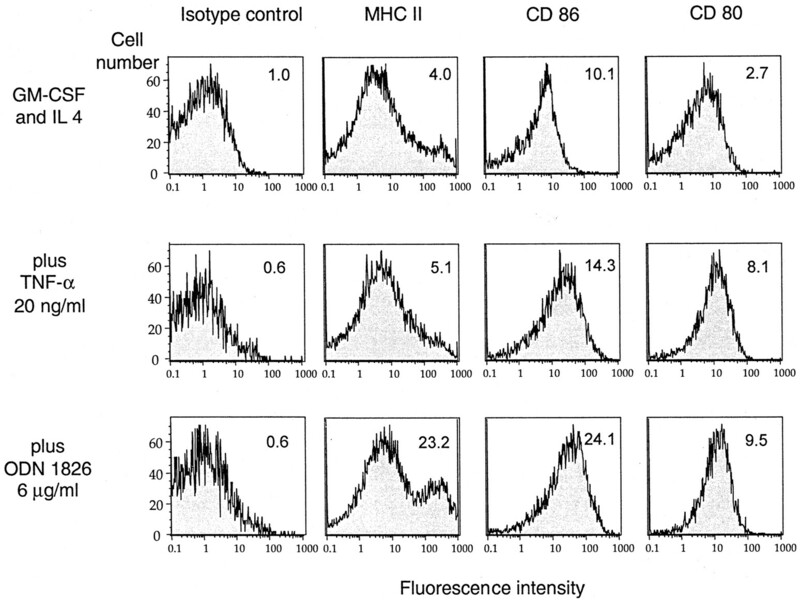 Surface density of MHC II, CD86, and CD80 was analyzed by flow cytometry. One representative experiment of three is shown. We noticed a dose-dependent effect of ODN-1826 with 500, 2000, and 6000 ng/ml inducing a CD80 expression of 80, 83, or 86% and a CD86 expression of 84, 87, or 90%, respectively. Analyzing the expression of MHC II, no significant dose-related differences could be observed (data not shown). Additional stimulation of ODN-1826-activated DC with 100 ng/ml LPS did not induce any further increase of the MFI of MHC II, CD86, and CD80 (data not shown), indicating maximal stimulation of ODN-1826-stimulated DC (data not shown). ODN-1826-stimulated DC placed in fresh medium maintained their dendritic, nonadherent phenotype for at least 1 wk without GM-CSF, IL-4, or additional stimulation. DC secrete IL-12 (7, 8, 9), a key inducer of proinflammatory Th1 responses. We investigated to what extent stimulation of DC influenced IL-12 secretion. As IL-4 has antagonistic effects, promoting anti-inflammatory Th2 cytokine profiles, we tested whether IL-4 (which is frequently added to DC cultures to increase DC survival and differentiation) inhibits IL-12 synthesis by DC. DC were cultured in the presence of GM-CSF and different concentrations of IL-4 (0, 20, and 80 ng/ml) for 7 days. IL-4 had no inhibitory effect on baseline IL-12 synthesis (Fig. 2⇓a). However, IL-4 addition increased DC yield. 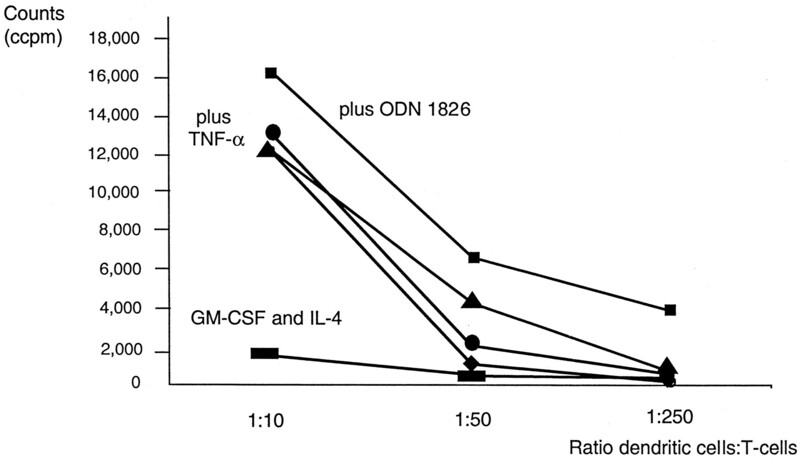 TNF-α increased the IL-12 secretion induced by GM-CSF and IL-4 alone up to 4-fold (Fig. 2⇓b). ODN-1826 induced an extremely high IL-12 production, 19-fold higher than after basic stimulation with GM-CSF and IL-4 alone. The extent of IL-12 secretion induced by TNF-α and ODN-1826 correlated with enhancement of surface expression of CD80, CD86, and MHC II (Fig. 1⇑). IL-12 secretion by DC. Bone marrow-derived precursor cells were cultured in the presence of 200 U/ml GM-CSF plus varying doses of IL-4 (a) or, in the presence of 200 U/ml GM-CSF, 20 ng/ml IL-4 and varying doses of TNF-α or 6 μg/ml ODN-1826 (b). At day 7 of culture, supernatants were measured by ELISA. The means ± SD of three experiments are shown. A major objective of tumor vaccination is enhancement of tumor-specific T cell responses. To determine the effect of DC maturation on T cell activation in vitro, we compared DC generated with GM-CSF and IL-4 alone to TNF-α- or ODN-1826-stimulated DC in their capacity to induce allogeneic T cell proliferation (Fig. 3⇓). Even at a relatively high DC number (DC-T cell ratio, 1:10), DC grown in the presence of GM-CSF and IL-4 alone marginally activated T cells. T cell proliferation induced by spleen cells was even lower (data not shown). In contrast, TNF-α- or ODN-1826-activated DC induced high T cell proliferation and there was a 1.3-fold increase between these latter preparations. However, at lower DC numbers (DC-T cell ratios, 1:50 and 1:250) we observed marked differences in the capacity of the respective DC to induce T cell proliferation. At a DC-T cell ratio of 1:50, TNF-α-activated DC induced a 2-fold (5 ng/ml TNF-α), a 4-fold (20 ng/ml TNF-α), and a 9-fold (80 ng/ml TNF-α) higher T cell proliferation compared with GM-CSF- and IL-4-stimulated DC, but were only marginally more effective at low DC numbers (DC-T cell ratio, 1:250). In contrast, ODN-1826-activated DC were potent T cell stimulators also at low numbers, inducing a 15-fold (1:50) and 12-fold (1:250) higher T cell proliferation than GM-CSF- and IL-4-stimulated DC. Thus, at low numbers, only highly matured DC were able to activate T cells. The effect of TNF-α- or ODN-1826-induced DC activation on T cell proliferation again correlated with the respective effects observed on expression of DC marker proteins and on IL-12 secretion. Effect of differential DC stimulation on T cell activation in vitro. Following culture in the presence of the indicated cytokine combinations, DC were compared in their capacity to stimulate allogeneic T cell proliferation. Day 5 DC were stimulated for 48 h with 200 U/ml GM-CSF and 20 ng/ml IL-4 only (▪) or additionally with 5 ng/ml TNF-α (♦), 20 ng/ml TNF-α (•), 80 ng/ml TNF-α (▴), or with 6 μg/ml ODN-1826 (▪). At day 7, DC were mixed with T cells at the indicated ratios. One representative experiment of three is shown. To determine the specificity of the immunostimulatory effect of ODN-1826 on murine DC, we repeated our in vitro experiments using the inactive control oligo ODN-1982. In all three experiments, ODN-1982-stimulated DC did not show an increased surface expression of MHC II, CD80, or CD86 compared with DC stimulated with GM-CSF and IL-4 alone. In contrast to ODN-1826-stimulated DC, no enhanced IL-12 secretion could be induced by stimulation with ODN-1982 compared with DC stimulated in GM-CSF and IL-4 alone. 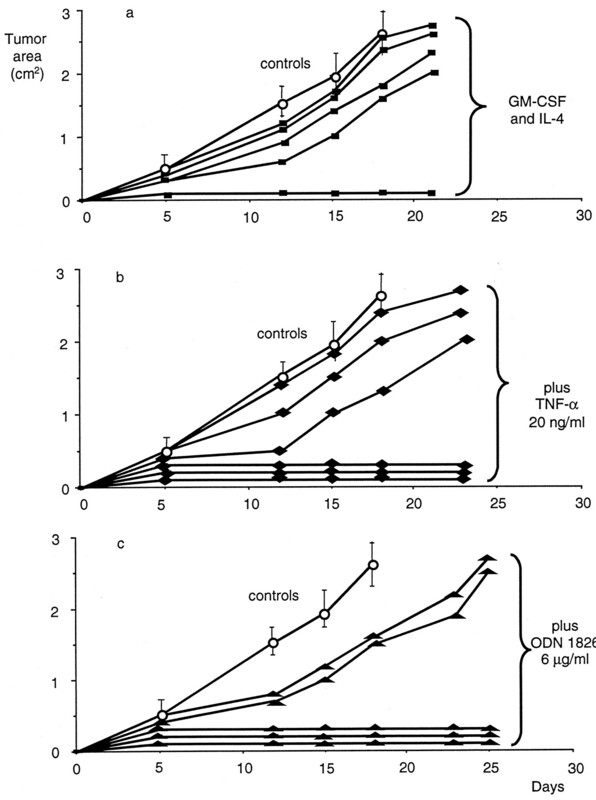 This correlates with the result of the T cell proliferation assays in vitro, where ODN-1982-stimulated DC showed an activation of T cells even below the level induced by DC stimulated with GM-CSF and IL-4 alone (data not shown). We evaluated whether enhanced maturation of DC and coculture with tumor cells improves the induction of protective tumor immunity. DC stimulated with GM-CSF and IL-4 for 7 days were cocultured with irradiated tumor cells at a ratio of 5:1 for 4 days. For the last 48 h of coculture, DC were activated with either TNF-α or ODN-1826. Mice were vaccinated s.c. with 1 × 106 cocultured cells and, 7 days later, mice were challenged with 5 × 105 viable tumor cells. Three independent experiments (n = 45) were performed, and one representative result with five mice per group is shown in Fig. 4⇓. Tumor growth in unvaccinated control mice was rapid, leading to death (by natural causes or by tumor burden-based euthanasia) by day 18, demonstrating the aggressive tumor formation by Colon-26 cells in BALB/c mice (Fig. 4⇓, ○). As a mean of all three experiments, 31% of mice immunized with DC that were cocultured with tumor cells in the presence of GM-CSF and IL-4 were completely protected against tumor formation (no development of tumors until day 21 and for at least 4 wk beyond). In the remaining 69% of mice, tumor growth was slightly delayed with survival up to day 21 (Fig. 4⇓a, p < 0.001). Injection of 5 × 105 Colon-26 cells 7 days after vaccination with ODN-1826-stimulated DC that had not been exposed to tumor cells led to s.c. tumor formation in all mice (n = 10, data not shown). Vaccination with TNF-α-stimulated DC cocultured with tumor cells rendered half of the mice (50%) resistant to tumor challenge while delaying tumor progression in the remaining 50% of mice and prolonging their survival to day 23 (Fig. 4⇓b, p < 0.001). Immunization with ODN-1826-stimulated DC cocultured with tumor cells completely protected 59% of mice and delayed tumor growth in the remaining mice, increasing their survival up to day 25 (Fig. 4⇓c, p < 0.001). In a preliminary study, we observed that the tumor vaccination potential can be further increased by two prophylactic immunizations before tumor challenge (data not shown). Prophylactic vaccination with differentially stimulated coculture cells. DC were cocultured with irradiated tumor cells for 4 days in the presence of 200 U/ml GM-CSF and 20 ng/ml IL-4 without further stimulation (a, ▪) or additionally stimulated for 48 h with 20 ng/ml TNF-α (b, ♦) or 6 μg/ml ODN-1826 (c, ▴). Coculture cells (1 × 106) were injected s.c. into the right flank. Seven days later, mice were challenged with 5 × 105 tumor cells. One representative experiment of three (n = 45) is shown (p < 0.001). Each curve represents one mouse except for the top curve ( ○), which is the mean ± SEM of untreated control mice (n = 5). To evaluate the tumor specificity of DC vaccination we also performed control experiments with a different BALB/c-derived tumor line (Renca). Two independent experiments at n = 30 each were performed, and one representative with five mice per group is shown in Fig. 5⇓. Tumor growth after injection of 5 × 105 Renca cells in unvaccinated mice (control group) was also rapid, leading to death by day 23 in all mice. Renca cells (5 × 105) were injected s. c. 7 days after vaccination with ODN-1826-stimulated DC cocultured with Colon-26 cells; all mice in the group (n = 10) finally succumbed to tumors (Fig. 5⇓a, p = 0.290). However, 6 of 10 mice challenged with Renca cells after prophylactic vaccination with Renca cells cocultured with DC did not show any tumor formation (three of five mice for the experiment shown in Fig. 5⇓b, p < 0.001). Injection of 5 × 105 Colon-26 cells 7 days after vaccination with DC cocultured with Renca cells led to lethal tumor development in all mice (Fig. 5⇓c, p = 0.250). In contrast, 6 of 10 mice challenged with Colon-26 cells after prophylactic vaccination (Colon-26) remained tumor free (three of five mice for the experiment shown in Fig. 5⇓d, p < 0.001). In addition, injection of 5 × 105 Renca cells 10 wk after complete rejection of Colon-26 tumors (following prophylactic vaccination with ODN-1826-stimulated DC cocultured with Colon-26 cells) led to s.c. formation of tumors in all mice (n = 10, data not shown). This indicates maintained specificity even after immunization-based rejection has occurred. Tumor specifity of vaccination with DC after coculture with tumor cells. DC were cocultured with irradiated Colon-26 cells (a and d) or Renca cells (b and c) for 4 days in the presence of 200 U/ml GM-CSF and 20 ng/ml IL-4 and additionally stimulated for 48 h with 6 μg/ml ODN-1826. Renca cells (5 × 105) were injected 7 days after vaccination with ODN-1826-stimulated DC cocultured with Colon-26 cells •, (a, p = 0.290) or in mice vaccinated with ODN-1826-stimulated DC cocultured with Renca cells (b, ▪, p < 0.001). Tumor growth after injection of 5 × 105 Renca cells in unvaccinated mice (control group ⬡) was rapid, leading to death at day 23. In addition, 5 × 105 Colon-26 cells were injected 7 days after vaccination with ODN-1826-stimulated DC cocultured with Renca cells (c, ♦, p = 0.250) or ODN-1826-stimulated DC cocultured with Colon-26 cells (d, ▴, p < 0.001). One representative experiment of two (n = 60) is shown. Each curve represents one mouse except for the top curve (⬡), which is the mean ± SEM of untreated control mice (n = 5). As ODN-1826-stimulated DC cocultured with tumor cells were the most effective prophylactic tumor vaccine, we next evaluated their therapeutic potential in three independent experiments (n = 40). Tumors were induced by s.c. injection of 1 or 5 × 105 Colon-26 cells followed by ipsilateral injection of 106 cocultured cells 3, 7, or 10 days later. One representative result with five mice per group is shown in Fig. 6⇓. In the untreated control mice, no tumors were visible 3 days after tumor challenge but became visible (0.3–0.5 cm diameter) at day 7 (see also Figs. 4⇑ and 8⇓a). These mice die or have to be euthanized around day 18. As a mean of all experiments, vaccination 3 days after injection of 1 × 105 tumor cells completely prevented tumor growth in 40% (two of five mice in Fig. 6⇓a, p < 0.05). In the remaining three mice, tumor size at day 18 was reduced, concomitant with a prolonged survival up to day 29 (n = 2) and beyond 32 days (n = 1). Vaccination 3 days after s.c. injection of 5 × 105 tumor cells (Fig. 6⇓b, p < 0.05) prevented tumor growth in one of five mice, and reduced tumor growth in the remaining mice prolonging survival up to day 23. Even when mice were vaccinated 10 days after injection of 1 × 105 tumor cells, reduced tumor growth and prolonged survival was observed (Fig. 6⇓c, p < 0.05). Thus, the time window for inducing tumor immunity was 10 days after tumor cell injection. For the high tumor challenge (5 × 105 cells), no prevention of tumor growth and only a trend toward prolonged survival up to day 20 (in three of five mice) following tumor vaccination 7 days after tumor challenge was observed (Fig. 6⇓d, p = 0.371). Therapeutic vaccination with ODN-1826-stimulated coculture cells. Coculture cells (1 × 106) stimulated with ODN-1826 were injected s.c. into the right flank 3 days after tumor challenge with 1 × 105 tumor cells (a, ♦, p < 0.05) or 5 × 105 tumor cells (b, ▪, p < 0.05), 10 days after tumor challenge with 1 × 105 tumor cells (c, •, p < 0.05) or 7 days after injection of 5 × 105 tumor cells (d, ▴, p = 0.37). One representative experiment of three (n = 45) is shown. 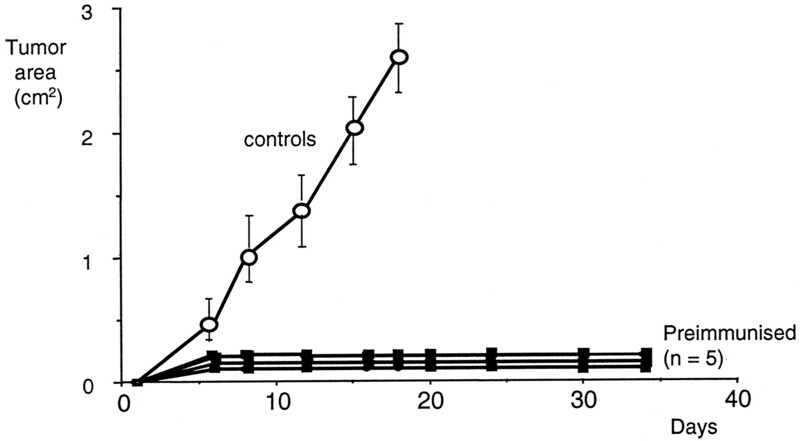 Each line represents one mouse except for the top line (○), which is the mean ± SEM of untreated control mice (n = 5). To study the persistence of tumor immunity, mice that had not developed tumors after prophylactic or therapeutic vaccination were rechallenged 6 wk after the first vaccination by s.c. injection of 5 × 105 tumor cells. As shown in the representative experiment of Fig. 7⇓ independent of the initial vaccination protocol used, no animal (of a total of 20 animals rechallenged) developed a tumor. This suggests that vaccination with DC cocultured with tumor cells mediates tumor protection lasting for at least 6 wk. In addition, no tumors formed even after repeated tumor challenges (data not shown). Tumor vaccination induces long lasting tumor immunity. Untreated mice (○) or mice that had demonstrated complete tumor protection after prophylactic vaccination (▪) were rechallenged with 5 × 105 tumor cells 6 wk after vaccination. One representative experiment of six is shown (p < 0.001). Our findings demonstrated that ODN-1826 enhanced the T cell-activating capacity of DC in vitro. This prompted us to examine whether in vivo the prophylactic vaccination using ODN-1826 (without DC) could influence subsequent tumor development. ODN-1826 was injected s.c. with or without irradiated tumor cells and, after 7 days, mice were challenged s.c. with 5 × 105 vital Colon-26 cells. Fig. 8⇓ shows one representative experiment of three (n = 30). Control mice developed rapidly growing tumors with no mice surviving day 18 (Fig. 8⇓a). Prophylactic injection of ODN-1826 without irradiated tumor cells resulted in a delayed tumor growth but no survival was observed beyond day 20 (Fig. 8⇓b, p = 0.173). ODN-1826 coinjected with irradiated tumor cells protected a small proportion of mice (25% for all experiments) and reduced tumor progression in most of the remaining animals, prolonging survival up to day 25 (Fig. 8⇓c, p < 0.05). Injection of irradiated tumor cells alone resulted in no protection (data not shown). Vaccination with ODN-1826 without DC. Untreated mice (a, ○) died at day 18. 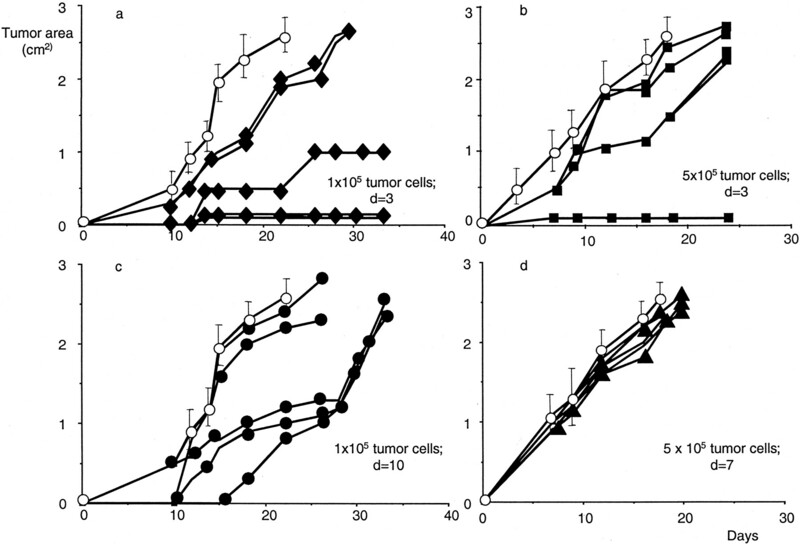 Single s.c. injections of 50 μg/ml ODN-1826 alone (b, ▪, p = 0.173) or as adjuvant for inactivated tumor cells (c, ▴, p < 0.05) were given to five mice per group. Seven days later, mice were challenged with 5 × 105 tumor cells ipsilaterally. Each curve represents tumor formation of one mouse. The mean tumor size of control mice (a) is shown as reference (○) in b and c. One representative experiment of three (n = 30) is shown. Using three function-related in vitro assays and a murine tumor model, we compared DC stimulated in the presence of GM-CSF and IL-4 alone to DC additionally stimulated with TNF-α or with the CpG motif-containing oligonucleotide ODN-1826 (34). We demonstrate that the extent of DC maturation, as reflected by surface density of costimulatory and MHC II molecules, correlated with the secretion of IL-12, with the T cell-activating potential in vitro, and with the induction of tumor immunity in vivo. ODN-1826 was identified as a very potent DC activator, clearly superior to the well-established DC stimulator TNF-α (5, 27, 35). For enrichment of DC from bone marrow, we modified the protocol published by Inaba (33) by additionally supplementing the culture medium with IL-4. In line with published data, this gave consistently better yields in DC and suppressed the development of monocytes (36). As IL-4 is the key inducer of Th2 responses and antagonizes proinflammatory IL-12, we ruled out that IL-4 inhibits IL-12 production by DC. 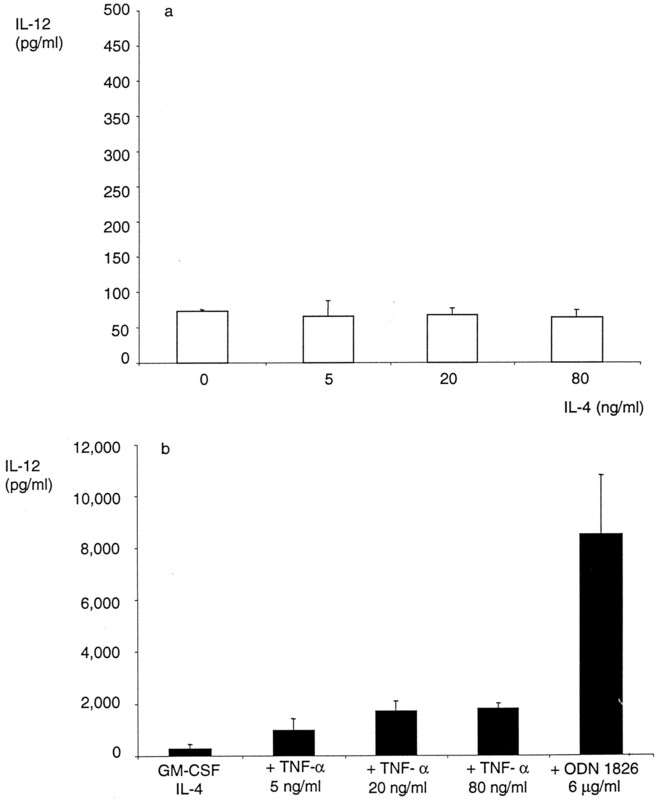 DC secreted stable baseline amounts of IL-12 independent of the IL-4 concentration used (Fig. 2⇑). This is concordant with the notion that the antagonism of IL-12 and IL-4 is not due to a direct suppressive effect on each other’s synthesis (37, 38, 39). Analyzing the effect of differential DC stimulation on IL-12 production, we found that ODN-1826 was the most potent stimulator. Its effect exceeded that of TNF-α by a factor of 5, which by itself was 4-fold more potent than baseline stimulation. DC cultured in the presence of GM-CSF and IL-4 alone expressed moderate levels of the costimulatory molecules CD80 and CD86, of the DC activation marker CD40, of the adhesion integrin CD54 (ICAM-1), and of the Ag-presenting proteins MHC class I and MHC II. TNF-α at its optimal concentration up-regulated DC markers MHC II, CD86, and CD80 1.3- to 3-fold. 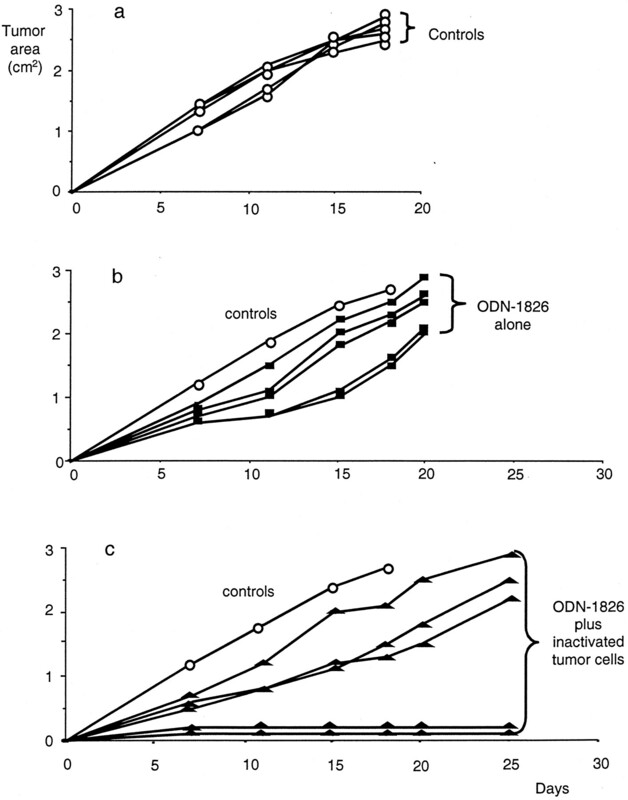 Compared with baseline stimulation, ODN-1826 induced an increase in mean expression of CD80, CD86, and MHC II by a factor of 4, 2, and 6, respectively. Examining the effect of DC maturation on in vitro T cell proliferation, we found a maturation-dependent T cell-activating potential of the respective DC preparations. Especially at low numbers, ODN-1826-activated DC induced the highest T cell proliferation, whereas TNF-α-stimulated DC again showed an intermediate effect. This finding may be of particular relevance in vivo, where DC are scarce in peripheral blood, tissue, and lymph nodes. Our data further imply that DC have to be strongly stimulated to raise a productive T cell response. We propose that this stimulation can be caused either by strong signals like bacterial DNA or by combinations of weaker signals such as TNF-α plus CD40 ligation. DC activating potential for ODN-1826 was described by Vogel and coworkers who showed that this oligonucleotide was nearly as effective as LPS in activating C57BL/6 fetal skin-derived DC to express MHC II, costimulatory, and accessory molecules and to stimulate T cell proliferation (9). In addition, it was about 10 times more potent than LPS in stimulating IL-12 secretion. Vogel et al. did not compare it to other stimuli such as TNF-α or IL-4. Using the control ODN-1982, we could not observe any stimulatory effects on the surface expression of MHC II, CD86, and CD80, the IL-12 secretion or the T cell activation of DC in vitro. This is completely in line with previous reports of control ODN, in which the CpGs were methylated or, inverted, lacked these stimulatory activities, confirming that the stimulatory effects of ODN-1826 were dependent on its unmethylated CpG motifs (Refs. 9, 15 ; and A. M. Krieg, unpublished observations). Of particular interest was the observation that the expression of DC activation and maturation markers correlated with the IL-12 synthesis and the capacity to stimulate T cell proliferation. For all parameters tested, ODN-1826 was the most potent stimulus, TNF-α had an intermediate effect, and GM-CSF and IL-4 alone showed the weakest effects. Therefore, a common intracellular pathway underlying DC activation and regulating the cellular aspects required for T cell activation seems to be triggered by different maturation-inducing stimuli. Recently, it has been shown that Toll-like receptors are evolutionarily conserved immune response-activating molecules and are expressed by DC, monocytes, and various other mammalian cell types (40). Toll-like receptor 2 was identified as the signal-transducing receptor for LPS, triggering a signal cascade that leads to activation of NF-κB (41) and c-Jun NH2-kinase (42, 43). NF-κB activation is central to the process of DC maturation (44) and NF-κB is activated by CpG-ODN in lymphoma cells (34) and macrophages (45, 46). It is not known whether Toll-like receptors also participate in the activation of DC by inflammatory signals other than LPS but it seems likely that the efficacy by which NF-κB is activated by the respective signal cascade determines the degree of DC maturation. A key finding of this work is that maturated DC after coculture with tumor cells were able to confer tumor-specific protection even in the BALB/c mouse strain, which is prone to raise a Th2 response (32). Using the aggressively growing colon carcinoma line Colon-26, which leads to euthanasia around day 18, allowed us to investigate the limits of DC-based tumor vaccination and to assess differences in the potency of the respective DC preparations. Vaccination with ODN-1826-stimulated DC cocultured with tumor cells prevented the development of tumors in ∼60% of mice. Preliminary findings of ongoing studies in our laboratory indicate that two vaccinations with ODN-1826-stimulated DC are even more protective, conferring tumor resistance to about 80% of mice. ODN-1826-stimulated DC were also therapeutically effective in this model, preventing tumor formation in up to 40% of mice (Fig. 5⇑). Thus, even in a Th2-biased mouse strain, a high level of protection against tumor challenge can be induced. This extends a recent study comparing different CpG-containing oligonucleotides in their ability to act as adjuvants in the induction of a Th1 response. ODN-1826 was identified as the most potent one (17). In correlation to their maturation status, DC stimulated with TNF-α or GM-CSF plus IL-4 alone and cocultured with tumor cells were less effective as prophylactic tumor vaccines and, also, ODN-1826-stimulated DC did not induce complete tumor immunity. At first glance, this seems to be at variance with studies published by the groups of Kufe and Mayordomo, who reported complete protection even though DC were stimulated only with GM-CSF (20) or with GM-CSF and IL-4 (21). We propose that this discrepancy may be due to the rather slow tumor growth induced by the cell lines used in both studies (MC-38, B16, and 3LL led to death between 28 and >60 days) and/or due to the Th1 bias of C57BL/6 mice (28). Irrespective of its reason, this discrepancy highlights the importance of thoroughly investigating different models before generalized conclusions on DC-based tumor vaccination for the application in man can be drawn. First clinical studies on DC-based tumor vaccination have been performed in patients with B cell lymphoma (29), melanoma (31), and prostate carcinoma (30). These studies achieved some clinical benefit (partial or complete responses), which was, however, limited to a rather small proportion of patients (∼25%). The observations of this study suggest that one reason for the limited success of the vaccination trials may reside in insufficient means to induce DC maturation. Because even the strongest stimulation of DC did not confer complete protection against aggressively growing tumors, other strategies are required to eventually maximize the clinical benefit of DC-based tumor vaccination. In a last set of in vivo experiments, we evaluated the injection of ODN-1826 as an adjuvant. When coadministered with inactivated tumor cells, it retarded the growth of subsequently injected colon carcinoma cells and in 25% of mice it led to complete protection from tumor growth. Other bacterial products are already approved or in clinical trials as adjuvants for tumor vaccines. The mycobacterial preparation bacillus Calmette-Guérin (which contains bacterial DNA with CpG motifs) has been approved for immunotherapy of urothelial cancer (47). Furthermore, it has been studied in patients who were tumor free following surgery for colon carcinoma. Bacillus Calmette-Guérin combined with autologous tumor cells reduced the recurrence rate by 44% in patients with stage II colon carcinoma resulting in a trend toward prolonged survival (48). For patients with stage III carcinoma, no clinical benefit was noted. Other adjuvants are currently in clinical trials, i.e., the saponin formulation QS21 and the LPS derivative monophosphonyl lipid A (MPL) (49, 50). Because IL-12 improves the efficacy of QS21 and MPL (51), and CpG-ODN induces high amounts of IL-12, we propose that a combination of QS21, MPL, and CpG-ODN may improve antitumor responses even further. In summary, we have demonstrated that surface expression of DC markers, IL-12 secretion, and T cell proliferation are coordinatedly enhanced during DC maturation. ODN-1826 stimulated this process most potently, whereas TNF-α showed an intermediate effect compared with basal stimulation with GM-CSF and IL-4 alone. In correlation with the in vitro stimulation, we found that, likewise, the induction of tumor immunity depends upon the extent of DC maturation. We conclude that in vitro maturation of DC is an efficient strategy to improve tumor vaccination protocols. We thank Angie Hackl and Oliver Blank for technical assistance and Sabine Pflughaupt for secretarial help. ↵1 This work was supported by Deutsche Forschungsgemeinschaft Ha 2780/1-1, Bundesministerium für Bildung, Wissenschaft, Forschung and Technologie 03-12235-6, University of Munich FöFoLe 44, Dr. Mildred Scheel-Stiftung 10-1309-En2, and the German-Israeli Foundation I-021-203.05/96. Additional support was provided by CpG ImmunoPharmaceuticals GmbH (Hilden, Germany) and Coley Pharmaceutical Group (Wellesley, MA). ↵2 C.B. and J.S. contributed equivalently to this work. ↵3 This work contains parts of the doctoral thesis of J.S. and that of A.S. at the Ludwig-Maximilians-University of Munich. ↵5 Abbreviations used in this paper: DC, dendritic cell(s); CpG, cytidine-phosphate-guanosine; CpG-ODN, synthetic oligodeoxynucleotides containing unmethylated CpG dinucleotides; MFI, mean fluorescence intensity; MHC II, MHC class II; MPL, monophosphenyl lipid A.